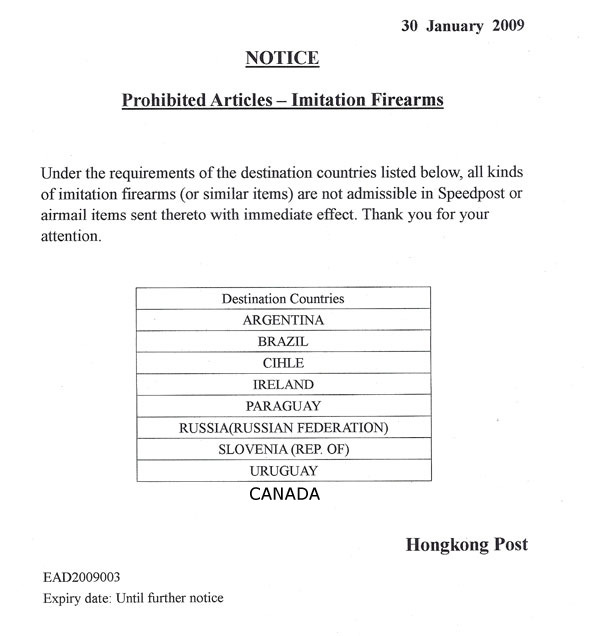 Follow country stop shipping airsoft guns or gun-like products by airmail or EMS to the following countries with immediate effect according to hong kong post office notice. * All Imitation Firearms countries still can shipping parts by Hong Kong Post. Orders will be processwithin 3-4 business days after payment is received. Each order we will provide tracking no. with customers. Every AEG will be tested completely before delivery , we will not refund for defective guns, so consider seriously before buying. All AEG will have their Muzzle painted in yellow. All buyer need over 18 years old. We will ship your paid items to your shipping address in our website database. If you wish to send your items to a different address pease contact us. By normal airmail shipment need 1 to 2 weeks , but when deliver to you will consider your side local post office. For the order below 2kg. Their order tracking system only record the date of shipment from hong kong but it needs your signature to receive the goods. If they got problem with the delivery it will spend a month or longer for hong kong post office to deal with foreign post office so is not recommended for high value items. Can receive your order faster, and their order tracking system provides full history tracking of your order but just in case they got problem with the delivery it will spend a month or longer for hong kong post office to deal with foreign post office so problem cannot be immediately resolved. Very happy to see an airsoft site with all the options that this gives. very nice gun. shoots well and was shipped fast. I love it and use it every day!